Whether you’re planning on making a written documentation of your business’ finances or simply want to keep track on the status of your monetary resources, you will need the services of accountants and bookkeepers since they are well trained in that kind of task. Accounting means more than just counting money, it actually involves a larger scope of responsibility which we will discuss later in this article. For now, let’s focus on the flyer templates that we are offering on this topic. 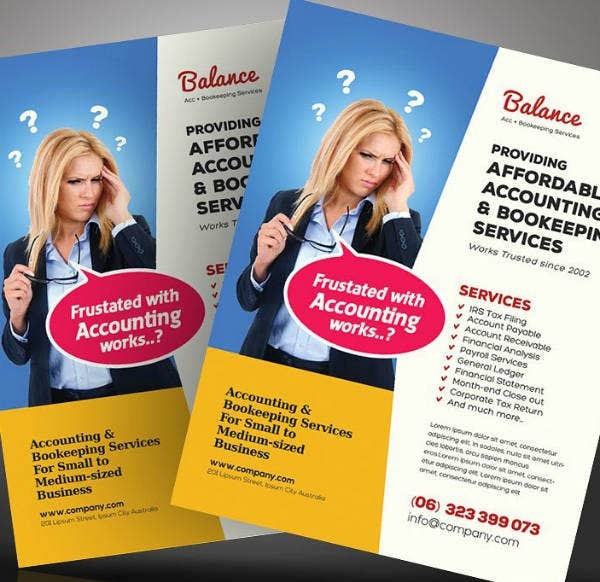 You may also see accounting & bookkeeping service flyers. 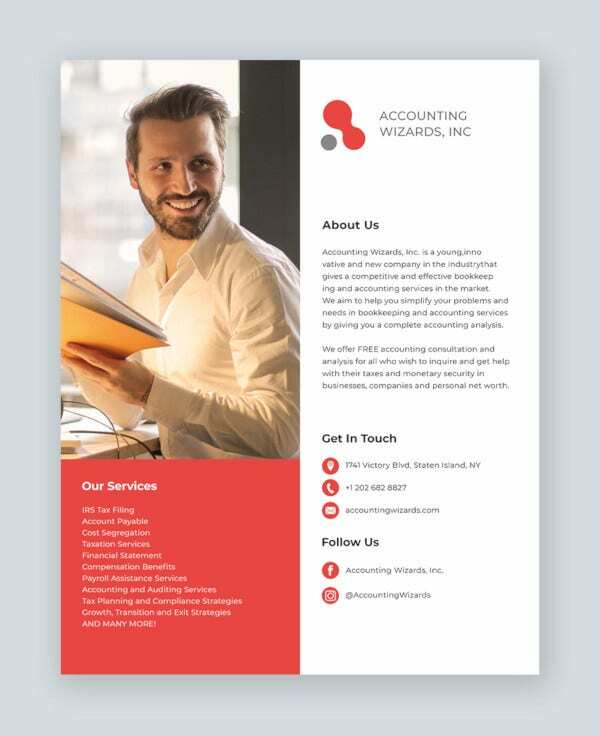 If you try to scroll down, you will see a collection of various templates and designs that will allow you to make your own accounting firm flyers. These templates have been gathered from multiple sources just so you won’t have to, and instead of having to start all the way from the bottom, these templates are already pre-designed and will only require a few edits. These flyer design templates are all downloadable, editable, and printable, but check them out first before actually downloading any of them. What Is an Accounting Firm? An accounting firm is an office that consists of accountants (certified or not) which specializes in providing accounting, bookkeeping, and auditing services to clients for a fee. These clients may either be individuals, organizations, or businesses. The services offered by accounting firms include but are not limited to the client’s payroll, taxes, accounts receivable, and accounts payable. 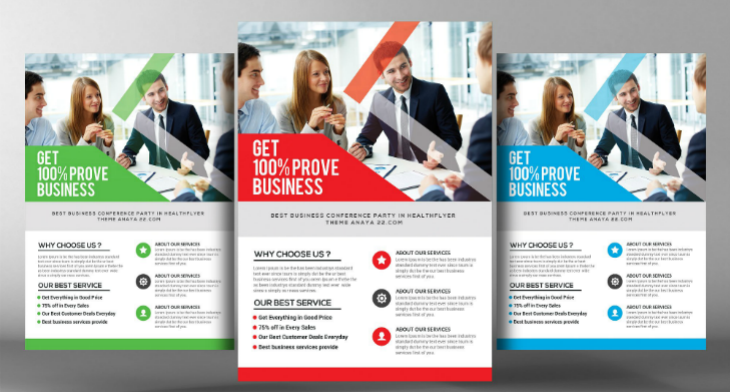 Also, check out our collection of business flyer templates. What Are the Types of Accounting Firms? The type of accounting firm that hires CPAs or Certified Public Accountants. Their main responsibilities include auditing, tax handling, and management consultations. Usually, the auditing and accounting of regional clients are being handled by regional accounting firms while local clients are being handled by local firms. You may also see banking flyer designs. 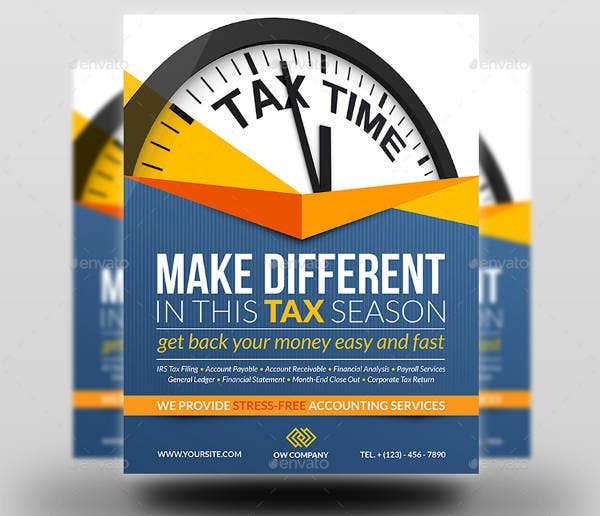 This type of accounting firm primarily focuses on tax preparation and planning for companies, organizations, and individuals. Also, tax accounting firms commonly hire CPAs. One of the most important factors that tax accountants should consider are the tax laws, in which they must always keep up with. You may also see tutoring flyer templates. This type of accounting firm handles the uncovering of fraudulent and illegal activities through the use of both legal policies and accounting skills. Oftentimes, law enforcement agencies seek the help of forensic accountants to work for them. When individuals or businesses commit crimes, the employer or any government agency can take legal action against them and would call upon forensic accountants to testify during the court hearings. 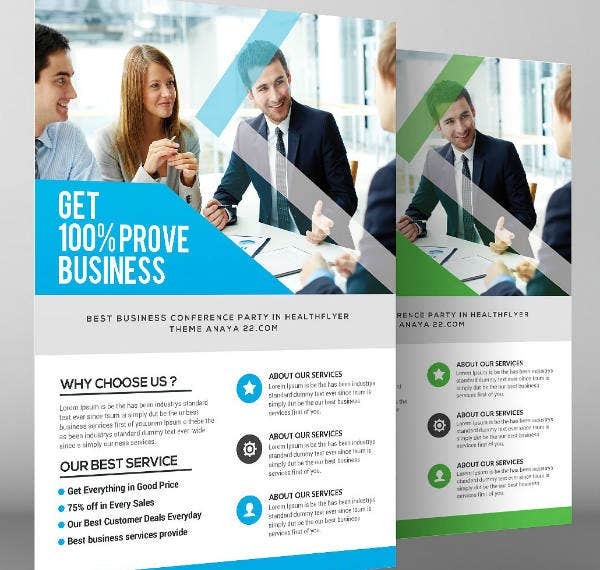 You may also see sample marketing flyer templates. These firms are tasked with completing accounting tasks for companies, regardless of the size. 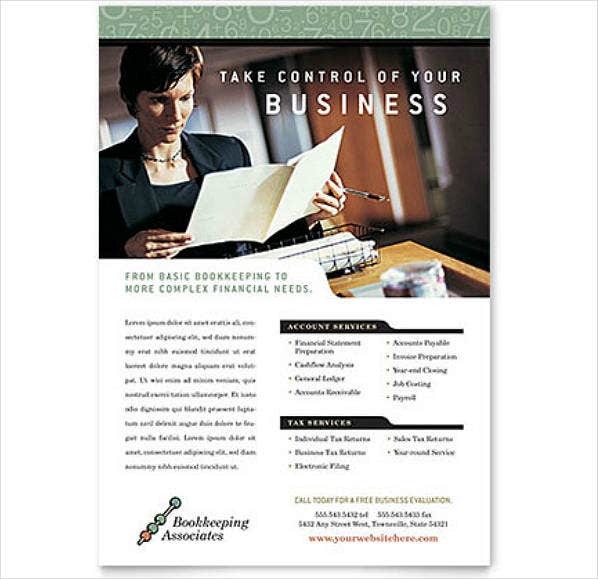 With bookkeeping firms, the bookkeepers are not required to have certifications, though they may do so if they want. 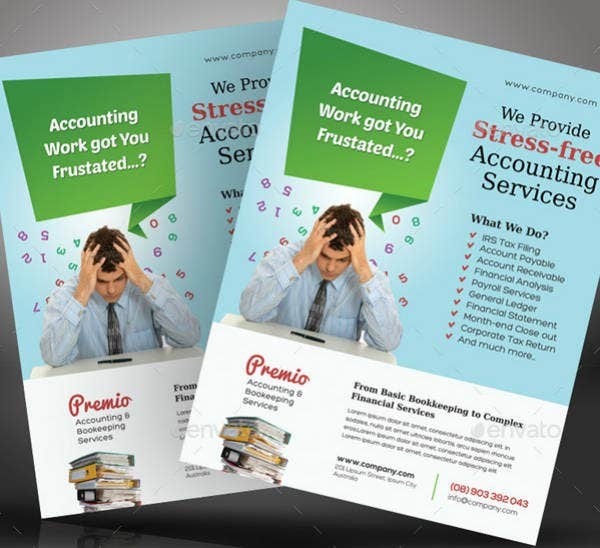 The services provided by bookkeeping firms include accounts receivable and payable, bank and credit sales reconciliation, and preparation of both financial statements and accounting write-ups. 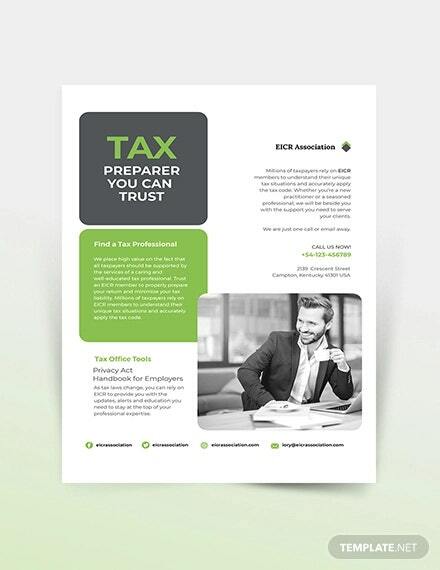 Other services they offer include preparation of business taxes and payroll, and they usually handle their client’s basic accounting tasks before forwarding it to CPAs to handle more complex tasks. 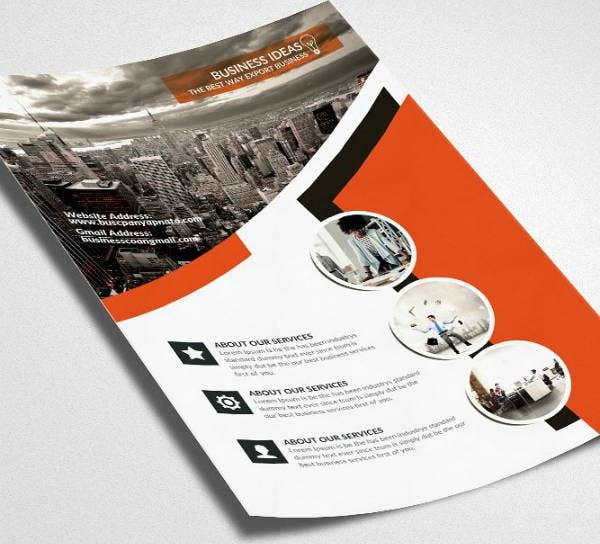 You may want to check out our collection of various agency flyer templates. What Are the Roles and Responsibilities of Accountants? One of the most important roles of an accountant is to collect and manage financial data. The accountant assures their client that the financial records that they are handling are in compliance with accepted policies on a corporate level. For organizations, their financial information should always be kept in its original form because it is the core component in operating businesses. 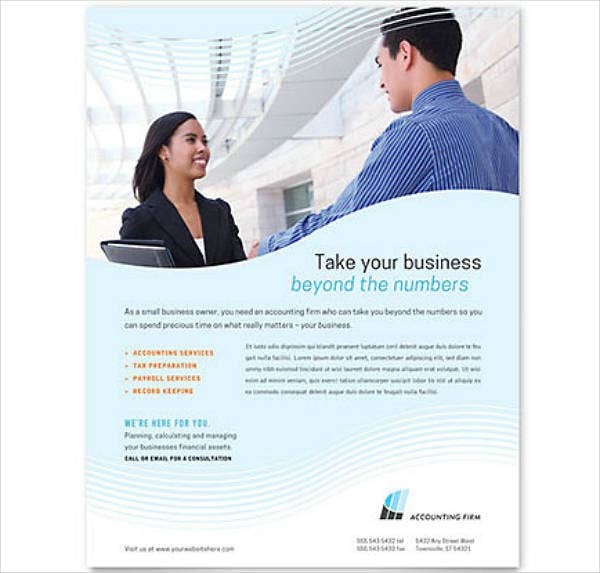 You may also see sample marketing flyer templates. Accountants also act as analysts considering they perform various types of analysis with the financial data that they have gathered from businesses. Oftentimes, they provide businesses with advice or assistance in making decisions, and these may range from which supplies to order to bills payment. Aside from that, accountants also analyze financial data to resolve any discrepancy or irregularity that have or may potentially arise. You may also see free flyers. Usually, sample financial statements are prepared by accountants and this may include monthly and/or yearly accounts based on the data gathered and analyzed. 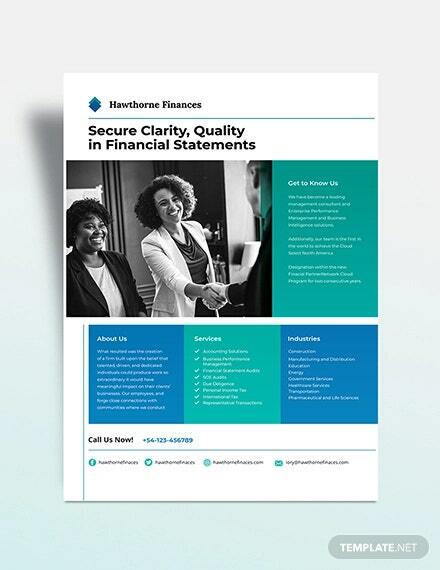 These financial statements or reports can be used in connection with the support and management of budgetary activities. Also, these reports can be used by financial directors or officers to develop, implement, and operate the company’s financial systems. Accountants are tasked with making sure that regulations and reports are compiled, both internally and externally. Quarterly, semi-annual, and annual reports have their own specific deadlines, and accountants should be able to comply with all of those, as well as handling tax implications. The monitoring or taxation issues is also part of the responsibilities of accountants. There are times wherein accountants will need to work with other financial professionals in order to work effectively. These financial professionals come from the four different fields of the industry which includes: public, management, internal auditing, and government accounting. 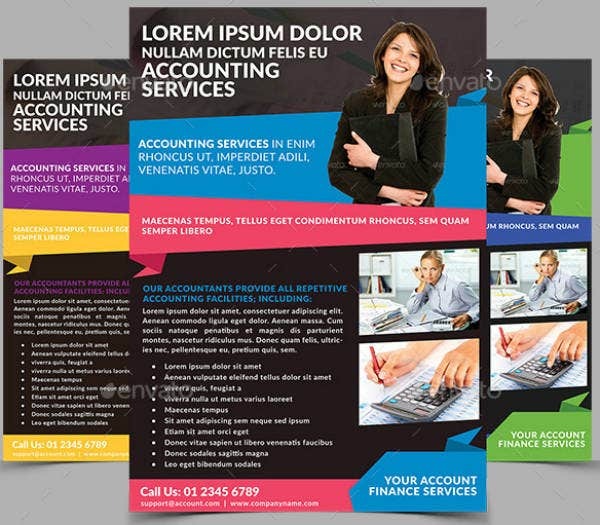 You may also see free PSD flyer templates. What Are the Skills Needed to Become an Accountant? 1. Considering that accountants commonly handle financial matters of individuals, businesses, or organizations, they will need to be well organized regardless of how busy they are. While discipline and focus may be the keys to becoming organized, a good system should also be utilized for an accountant to be able to fulfill their duties effectively. Also, being organized can help in providing accountants with a good impression not only from clients but also their co-workers. 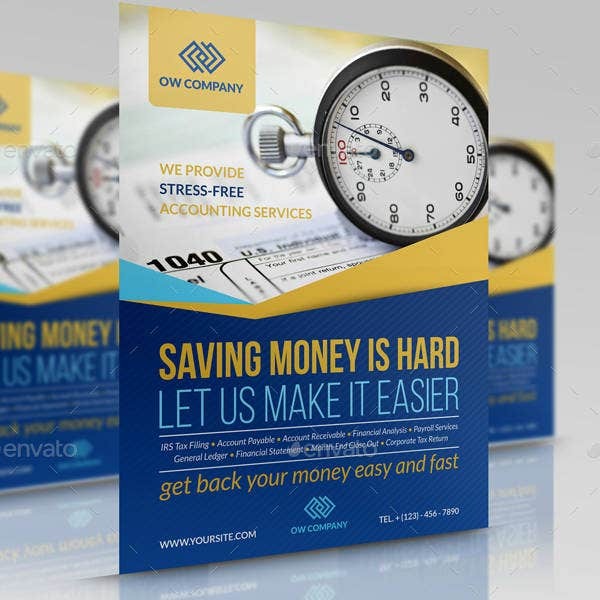 You may also see personal finance flyer templates. 2. Another essential skill that an accountant should have is time-management, which can help in actually managing all the workload that comes to them. Effective time-management should always go hand in hand with being organized in order to meet with deadlines, impress clients, co-workers, and your employer, and also balance your time between work and life. 3. The entire accounting industry can change with the snap of one’s fingers, and if one doesn’t pay attention, a lot of issues may come into play especially in the long run. This is how dynamic accounting is, which is why accountants are required to be adaptable in order to keep up with the changes. You may also see flyer templates. 4. Just like any other profession, good communication skills are also needed by accountants, and they will use these skills when they interact with clients and co-workers. When it comes to communication, this actually refers to both written and oral. You may also see real estate flyer templates. What Are the Advantages of Using Flyers? 1. 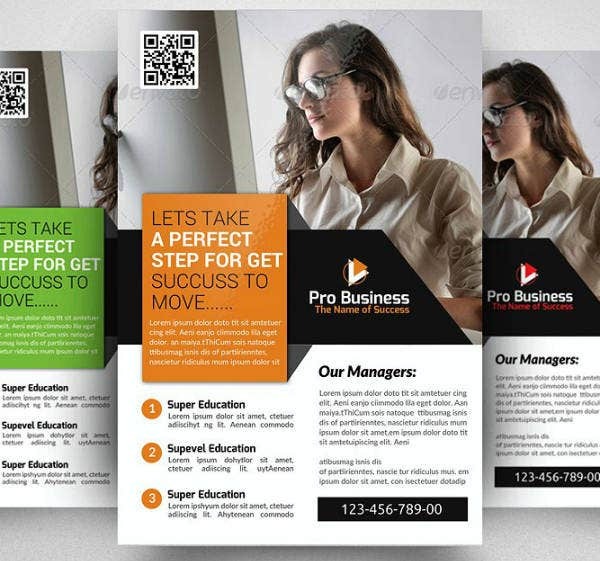 Flyers are meant to be distributed not only from advertisers to prospects but also from prospect to prospect, which actually helps in generating even more leads. With just a single copy of the flyer, it can already draw in multiple prospects, considering that the flyer is designed properly. You may also see design flyers. 2. 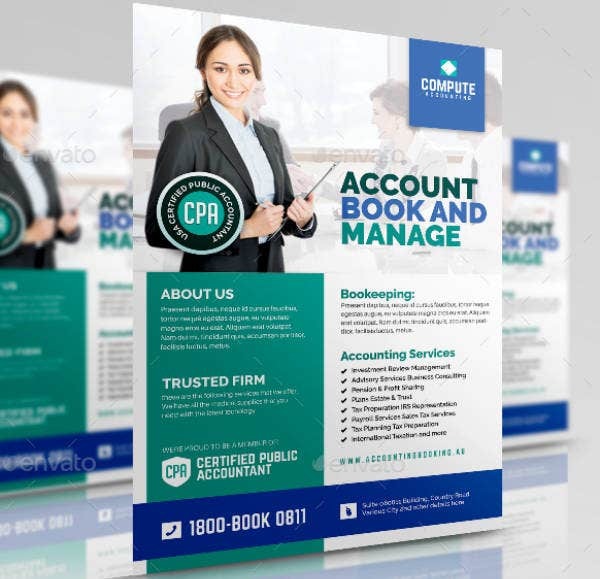 Flyers are cheap and easy to produce, which means that regardless of the size of the business or if they are already tight on the simple budget, they may still be able to make flyers. And with regards to its preparation, they don’t require a lot of thinking and can even be prepared in less than an hour. 3. Flyers allow advertisers to get creative, which helps advertisers to think of this as more than just business, but also something to enjoy from. A word of advice, though, when trying to be creative with the flyer design, keep it clean and easy to read. 4. Flyers can be distributed or made public through other methods which are something that you can’t do with other marketing tools. Aside from just doing flyer distributions, flyers can also be sent through the mail, placed inside magazines or newspapers, or posted on walls just like posters, and placed on top of counters or tables just like brochure designs. 1. During flyer distribution, the people that you are handing your flyers to are those who are busy or are in a hurry, which is why you shouldn’t take a lot of their time just to be able to share with them what you are promoting. This is why it is very important to keep the content of your flyer brief and straight to the point, to prevent the risk of wasting your prospect’s time. You may also see word flyer templates. 2. In relation to keeping the content short and direct, you should also keep the flyer layout organized. A flyer is fairly easy to read if it is organized, and this is what you want for your flyers. 3. The design on your flyer may already be able to attract people, but do it with a catchy headline to take it up a notch. The reason behind this is because the headline provides people with an initial impression on what you are trying to advertise, and this can really help in drawing more people into the flyer and into your simple business. 4. Don’t forget to proofread your work since any presence of spelling or grammar errors can become a sign of laziness and lack of professionalism. You may also see sample holiday flyers. 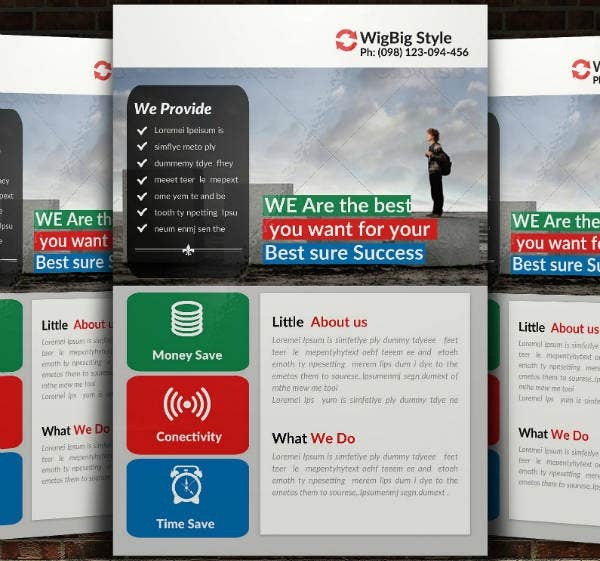 If you’re interested, you may also check out our collection of various beautiful flyer templates. 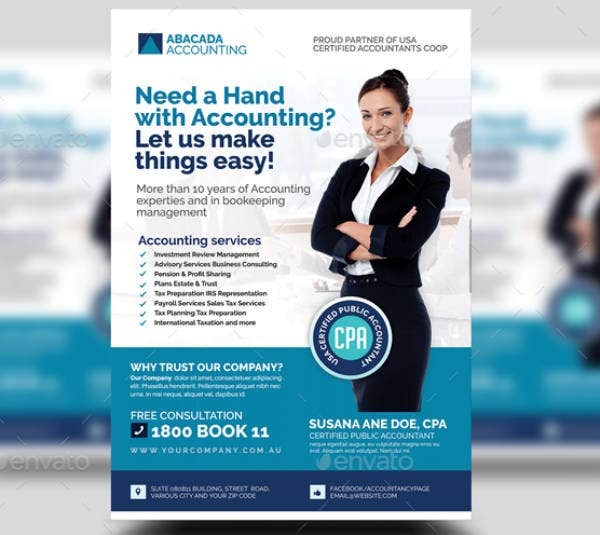 If you are wondering whether these multipurpose flyer templates are indeed worth downloading to help you in promoting your accounting firm, then allow us to provide you with answers to those. Quality-wise, we’re sure you have gone through every single template and saw how visually appealing the designs are, and not only are they stunning, but they are also designed in such a way that makes them functional. Aside from that, regardless of how much you edit them, the resolution and sharpness will remain as pristine as it originally is, and that is a guarantee. With regards to its editability, we already mentioned during the introduction that these templates are highly editable, but you can only enjoy that feature if you are using the right editing tool. For these templates, you will need Adobe Photoshop, Illustrator, and Acrobat in order to edit PSD, AI, and PDF files, respectively. And lastly, these templates have been priced very reasonably, so you don’t need to spend a lot to download them. We hope those statements cleared up your doubts, and if it did, then start downloading a business flyer now.